Applicants must already be enrolled for the Darmstadt Summer Course! Workshop participants are invited to attend Christina Kubisch’s live-installation Orchestra On A Wire on 15 July (12:00 or 13:00). The workshop is based on the research of sounds which we normally cannot hear: electromagnetic waves, underwater sounds, solar frequencies, radio waves and others. The workshop aims to explore and record soundscapes and signals in and around Darmstadt and to transform and transcribe them into a work which will be presented at the end. 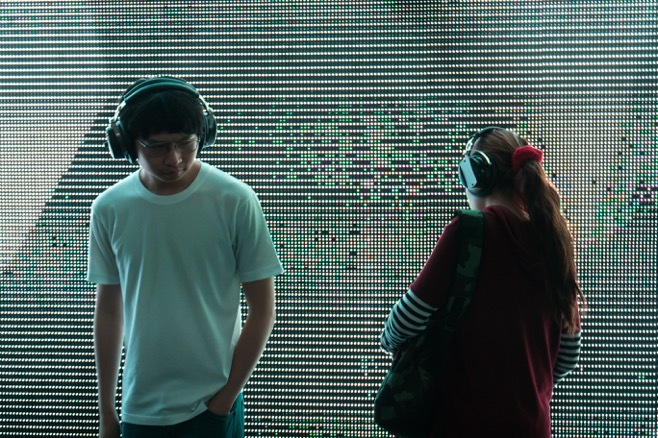 The result of the acoustic research can be a site specific installation, composition, sound sculpture, performance or other. A basic knowledge on how to use recording facilities is required. Participants should bring portable field recorders and microphones if possible. Participants who would like to work with computer audio software should bring their own programs on their own laptop, as we can only provide a very limited number. Basic knowledge of how to edit sound and / or use audio software is recommended, as well as a pair of good closed headphones. Students can work on a project alone, but collective work is very welcome. Special recording facilities for exploring hidden sounds (like hydrophones, electromagnetic receivers, contact microphones) will be provided in a limited number, but any special equipment brought by participants is highly welcome. Please indicate in the application, what kind of special gear you would like to bring and to use. As the workshop and the supervision by Christina Kubisch will be very intense – the actual realization of works continuously will go along with both individual one-to-one tuition as well as group discussions –, the participants in the workshop should be aware that a participation in other activities offered in the Darmstadt Summer Course (tuition, lectures, other workshops etc.) will only be possible to a limited extent. – a short expression of interest in taking part in the project noting what kind of special gear you would like to bring and to use.